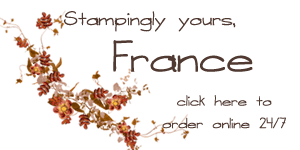 Something different for today Stampin’101. What are sketch? while other say is it a way to create a card without a sketch….. Well in today video on my blog at www.frenchiestamps.com I will explain what are sketch. Our team do sketch well I have Stephanie S and Sara L that take care of designing the sketch for our team thank YOU both for your hard work and this week Sketch was design by Stephanie. Every other week we get a new sketch, it is fun to see the different creation with the same pattern in mind. A sketch is only a guide to create like where you see the shape it say any shape the color has nothing to do with this excepted to show the layers. Now that you see the sketch on top try it and tell me what you think and now it is time to share my team creation . this lovely ocean scenery was created by Martha M.
This one was my creation and I wil have a video next week or so to show you how easy to have a perfect matching boarder fun and easy. Now for the video visit my blog at www.frenchiestamps.com and give it a try 🙂 Thank YOU all for your support! Good morning, Frenchie! I love your tutorials. In fact, most of them are on my pinterest page! I was wondering if it's possible to get pictures of the cards you used in your sketch video. The ones using By the Tide and the red, white & blue cards are awesome, as are all your cards! Thank you, Frenchie! You're an amazing artist, and soooo helpful!